If anyone knows me, they know I do not cook. I just don't have the talents, or maybe I just haven't put any effort into gaining these skills. As I saw these baby apples in Fresh Market in my hometown, my friend said they would make great caramel apples and I was stuck on the idea I had to try it! I went back to get the apples and caramel and ran into these baby pears that I thought would be perfect to pair with the apples. These were my contribution to our Thanksgiving feast and turned out to be a hit, especially amongst the small children. All I did was follow a basic caramel apple recipe like this one from All Recipes and I added nuts on some apples. For the pears I just bought dipping chocolate and dunked them in adding a skewer to top it off. 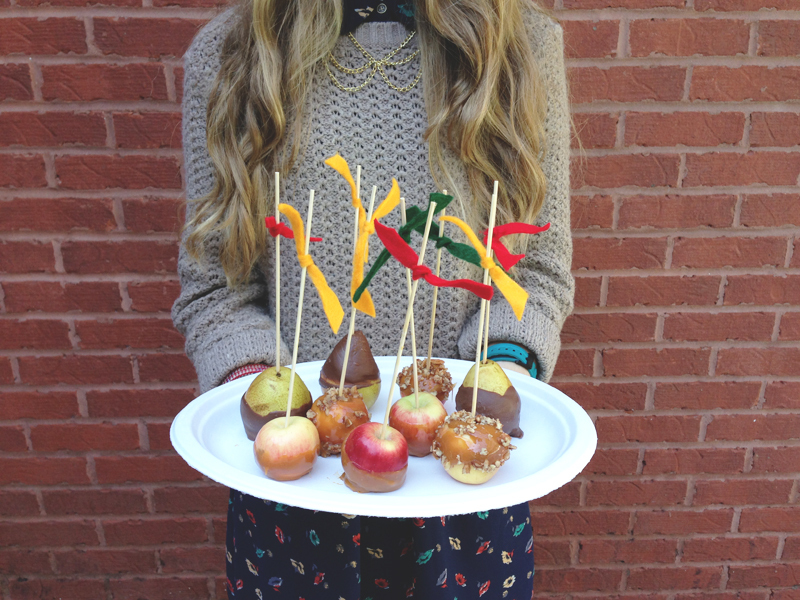 These mini fruits were full of flavor and will now be my go-to party food contribution. Aren't they just so cute?! Everything is cute miniature..